December 1996 — Transient tracers provide us with a unique opportunity to visualize the effects of the changing climate on the ocean. They trace the pathways climate anomalies follow as they enter and move through the ocean and give us valuable information about rates of movement and amounts of dilution. This knowledge is important for developing ocean-climate models to predict long term climate changes. Humankind’s activities have resulted in the release of a number of globally distributed substances into the environment. These substances enter the oceans, and, although they have little, if any, impact on the environment, they travel through and “trace” the biological, chemical, and physical pathways of the ocean. The distributions of these “tracers” change with time. For example, isotopes created by atmospheric nuclear weapons tests in the 1950s and 1960s were introduced in a pulselike fashion, while atmospheric concentrations of chlorofluorocarbons (CFCs), which threaten the earth’s ozone layer, have been increasing with time. We refer to these substances in the ocean as “transient tracers” because their distributions are evolving. Transient tracers are valuable tools for studying ocean climate. First, because they are new to the ocean environment, they are indicators of “ocean ventilation.” Ventilation is the imposition of atmospherically derived properties on water masses. For example, waters in contact with the atmosphere will have dissolved oxygen concentrations increased to equilibrium values with the atmosphere. Providing their time history in the atmosphere is known and the manner in which they are transferred to the ocean is understood, they can be used to construct and test models of ocean ventilation and circulation. Observations of their distributions in the ocean and time series measurements of how they change with time are powerful tools: They provide direct visualization of climate changes, and they trace the pathways along which ocean climate perturbations propagate into the oceans. That is, changes in characteristics and volumes of water masses due to climate variations ultimately influence deeper, more isolated regions of the oceans. How these changes move to the deep ocean from regions of contact with the atmosphere must be understood. This process is an important mechanism whereby the oceans couple to the atmosphere on longer time scales, and probably plays a role in determining the interannual to decadal variations in global climate. Observations of tracer distributions provide information on processes that are very difficult to observe any other way. Mixing and dilution, for example, play a dominant role in the southward transport of material along the deep western boundary of the North Atlantic. It has long been known that newly ventilated North Atlantic Deep Water travels southward in a concentrated current, hugging the western edge of the Atlantic basin. Although direct current measurements indicate velocities of tens of centimeters per second, the actual average propagation rate of tracers down the western boundary is only one or two centimeters per second. This is because there is a tremendous amount of entrainment and mixing associated with water recirculating within the rest of the basin. The mixing slows the progress of tracers and climate anomalies. Transient tracers are perhaps the only tools for measuring the amount of interior exchange and downstream propagation rates. It is said that every cloud has a silver lining, and that seems to be true even if it is a mushroom cloud. Although the atmospheric testing of nuclear weapons released alarming amounts of radioactive debris into the environment, and caused untold damage to both the environment and human health, it also provided oceanographers with some unique tools to study ocean circulation and ventilation. We have had the opportunity to observe the entry of these substances into the oceans, and to see how they are moved around by physical, chemical, and biological processes. One of these bomb-produced tracers is tritium, a radioactive isotope of hydrogen. There is very little natural tritium in the world (the entire global inventory would only weigh a few kilograms! ), but several hundred kilograms were created in the hydrogen bomb explosions. This tritium was injected into the stratosphere, almost immediately oxidized to water, and fairly rapidly rained out onto the surface of the earth. Since it is chemically bound up as part of the water molecule (it is, after all, hydrogen), tritium is an ideal tracer of the hydrologic system. Further, since the bulk of the atmospheric weapons testing was done in the northern hemisphere, most of the tritium was deposited in the high latitude northern hemisphere. Thus it is an ideal tracer of ventilation and water mass formation in the North Atlantic. We can see this in the first figure above, which provides a bird’s eye view of tritium distribution in the North Atlantic in 1981. Picture yourself hovering somewhere over Norway, at an altitude of a few hundred miles. You are looking southwestward and downward on an isosurface of tritium in the North Atlantic. An isosurface is the two-dimensional analog of a contour line on a map, shown here in a three-dimensional ocean. The blue “blanket” you see in the picture is the 1 Tritium Unit isosurface, where we find a ratio of 1 tritium atom to 100,000,000,000,000,000 hydrogen atoms. This isosurface corresponds to about 5 or 10 percent of the maximum surface water concentrations of tritium during the mid 1960s, when it was at its peak. All the water beneath this blanket has remained relatively isolated from the tritium invasion, and, conversely, all the water above this blanket has been at the sea surface, exposed to the atmosphere, and thus ventilated or otherwise involved in interaction with the surface ocean in the 15 to 20 years between the bomb tests and this survey. The blanket lies at about 500 to 1,000 meters depth in the subtropics, but deepens to 1,500 to 2,000 meters just south of the Gulf Stream off the New England coast. This is the effect of the Gulf Stream recirculation, a tight gyre that effectively ventilates the upper part of the ocean in this region. There is also a fold extending southward from this region at about 1,200 meters depth, marking the intrusion of intermediate depth waters toward the tropics. Most notably, however, is the dramatic dive that the “blanket” takes to the north, disappearing into the ocean floor. The track along which this happens parallels the Gulf Stream Extension/North Atlantic Drift. All the waters north of this line have been ventilated to the ocean floor on 10 to 20 year time scales. This is a powerful statement regarding the time scales of ocean ventilation, and has profound implications concerning how rapidly climatic variations can propagate through the oceans. We can see this in yet another way. The figure at right is a plot of tritium vs. depth for a time series near Bermuda from the late 1960s to the late 1980s. The tritium data has been adjusted for decay to the same date (January 1, 1981) to allow us to more clearly see the time trends. The most obvious trend is the downward propagation of a tritium maximum (deeper red) from the surface in the late 1960s to about 400 meters depth in the late 1980s, a downward penetration rate of 18 meters per year. However, from the perspective of climate change, the most important signal is the sudden increase in tritium (green) at about 1,500 meters in the late 1970s and at 2,500 meters in the mid 1980s. Both of these features correspond to the onset of significant cooling events seen in the deep water at this station. The correspondence between the sudden tritium increases and cooling offsets is highly suggestive of significant changes in deep water ventilation at those times. Indeed, if we could take another “picture” of the tritium blanket shown in the figure on page 29, we would see that it has been pushed further downward and southward by a climatic event. The development and manufacture of chlorofluorocarbons (CFCs) for use in refrigerators and air conditioners (and later as spray can propellants) seemed like a good thing at the time: CFCs were easy to manufacture, nontoxic, chemically inert, and stable. Production, use, and ultimate release of CFCs into the atmosphere increased annually in an almost exponential fashion from their introduction in the 1930s. The unfortunate influence of these compounds on the ozone layer, however, has lead to international reduction in their manufacture and use. In 1990, the US and 55 other nations agreed to end CFC production by 2000. Meanwhile, however, oceanographers have found another “silver lining” in this ecological cloud, which has permitted us to study ocean ventilation and circulation: Waters that have been in contact with the atmosphere in the past few decades have taken up some of these compounds, and hence have been labeled in a distinctive way. Thus the distribution of CFCs in ocean water provides us with important clues regarding the pathways of newly formed water masses. In the 1970s and early 1980s, there was not much winter time convection and formation of Labrador Sea Water. In fact, tracer sections (lines of stations) taken across the Deep Western Boundary Current to the south showed a decided lack of newly ventilated Labrador Sea Water. This hiatus is somehow related to the complex interplay between changing climatic conditions in the area and the freshwater outflow and budgets of the Arctic. The late 1980s and early 1990s have heralded a dramatic change in climatic conditions in the Labrador Sea. These changes have resulted in the production of a large amount of Labrador Sea Water, which is now invading the ocean interior. You can see this beginning to happen in the figure at right, a time series of CFC sections made along 55°W south of the Grand Banks. 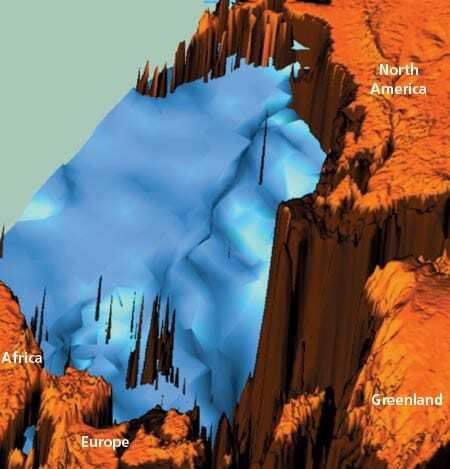 Labrador Sea Water occurs in these sections at a depth of about 1,500-2,000 meters (the middle heavy dashed line). Notice that there was very little CFC-11 in this water in the 1983, although there is a CFC tongue at a shallower level characteristic of waters that are formed in the southeastern corner of the Labrador Sea (the shallowest heavy dashed line). Below the Labrador Sea Water core, there is a weak but detectable CFC core in waters characteristic of Denmark Straits Overflow water (marked here by the deepest dashed line). Combined, these three water masses form the Deep Western Boundary Current system of the North Atlantic, and are responsible for the southward transport of newly ventilated waters. However, in the 1990s, there is a sudden increase in the amounts of CFCs in the Labrador Sea Water core, as well as a steady increase in the deeper core associated with waters from the Denmark Straits overflow. This increase is continuing through the 1990s and is direct evidence of the newly ventilated waters’ arrival. This again is a signature of the penetration of climatic anomalies into the ocean interior. While the 55°W sections capture the invasion of the newly formed waters into the northern Sargasso Sea, the pathway southward is not a simple one. The Deep Western Boundary Current is not a continuous ribbon of flow extending all the way from the Grand Banks to the equator, but rather a composite consisting of series of interconnected gyres lined up along its path. A fluid parcel that passes by the Grand Banks may spend most of its time looping through these gyres, and only part of its time in the Deep Western Boundary Current. This is why the mean propagation speed of tracers down the western boundary is only 1 to 2 centimeters per second, while velocities in the actual core of the Deep Western Boundary Current are 10 to 20 centimeters per second. The figure at right is a plot of tritium and tritium-helium age in the core of the Deep Water Boundary Current vs. distance downstream from its origin. We see that the core becomes progressively older (about 20 years in 10,000 kilometers) corresponding to a speed of about 1.5 centimeters per second. Notably, the tritium concentration in the core decreases more than tenfold downstream, partly due to decay, but largely due to dilution and mixing with older, tritium-free waters. This process of mixing is an important mechanism for ventilating the abyssal ocean. 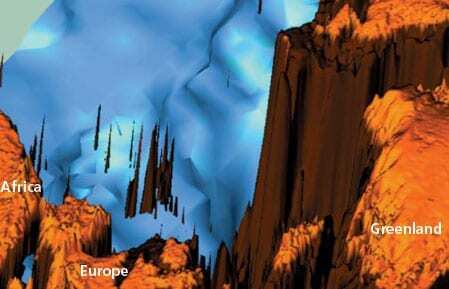 It’s through this process that climate anomalies make their way into the deep ocean. Thus the transient tracers are telling us something very important about the propagation of climatic changes into the deep ocean. They highlight the pathways and give us the rates of movement and dilution in the ocean. This information is valuable because the ocean provides the long term memory and feedback in the coupled ocean-atmosphere-climate system, and is the key to beginning to make long term predictions in our ever changing climate. The research discussed in this article was supported by the National Science Foundation and the Office of Naval Research. Bill Jenkins started life as a nuclear physicist but drifted into environmental sciences out of a secret yearning to become a forest ranger. Not having a good sense of direction, and fearing black flies, however, he ended up as an oceanographer on Cape Cod. He joined the WHOI Chemistry Department (now the Department of Marine Chemistry and Geochemistry) in 1974. Bill Smethie’s interest in oceanography began during childhood summers spent at his grandfather’s log cabin on the Virginia side of the Potomac River. He embarked on his first oceanographic cruise at age 7 when he attached a makeshift sail to his inner tube and set sail for the other side of the river. His doting aunts prevented him from making it to the other side, but ever since he has had a never-ending curiosity for what lies beyond the horizon. He joined the Geochemistry Division of Lamont-Doherty Geological Observatory in 1979. A time series of tritium in the Sargasso Sea near Bermuda. The plot of tritium vs. depth and time shows the sudden arrival of tritium at intermediate depths (1,000 to 1,500 meters) in the late 1970s, and at deeper depths (2,000 to 2,500 meters) in the late 1980s. These events correspond to the onset of cooling at these levels, and signal the arrival of newly ventilated waters in response to climate changes farther north. Four chlorofluorocarbon (CFC) sections taken at various times along 55°W south of the Grand Banks. Note the absence of any significant CFC signal at the depth of the Labrador Sea Water (about 1,500 meters depth) in 1983, but the sudden flooding of these depths with CFCs in the later sections, as newly formed Labrador Sea Water flows around the Grand Banks and into the Sargasso Sea. These changes correspond to the tritium increases seen in the Bermuda time series (see previous figure).